Premier Drum kits For Sale! Premiering my New Inventory of Signias and APKs! When School of Rock needed a drum set for their Littleton, CO location, I gave them over twenty different options to choose from. 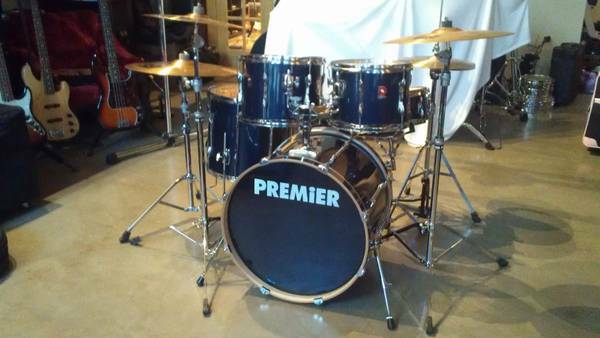 Out of all of these options they chose a five piece Premier APK drum set that looks and sounds great! Premier's been making drums in England for the past 90 years and have been the choice for artists including Ringo Starr, Keith Moon, Rod Morgenstein, and Phil Collins. The hardware on these kits is brutal and built to withstand rigorous abuse. They were on tour with Pink Floyd, Iron Maiden, and Radiohead (all shows that were performed by students at School of Rock by the way) and sound awesome! Vintage Premier drum kits are somewhat rare nowadays and are considered by most experienced drummers as high quality drums so I keep my eye out for them and grab them whenever I can. I've been using a rotating lineup of awesome Premiersas pro-grade gear available for backline rental for years, and they've never failed a customer. Check back often for new Premier drum kit finds and take one home today for low dough! Posted on August 28, 2013 by Pete and filed under Inventory and tagged School of Rock Premier APK Premier XPK Premier.